Asserting that Netanyahu 'bowed down' before coalition partners, Livni claims funding to haredim and Judea and Samaria will hurt Israel. MK Tzipi Livni joined on Thursday the corral of left-leaning voices criticizing Prime Minister Binyamin Netanyahu and the last-minute government he formed Wednesday night. Specifically, Livni blasted Netanyahu on Army Radio for "folding" in front of his coalition partners. 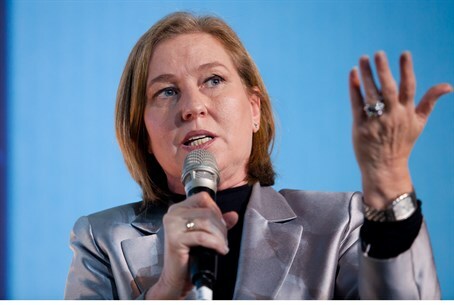 "The main problem is the nature of this government," Livni asserted. "The distribution of funds to sectors and not to the Israeli people as a whole, looking not at the state of Israel, rather at survival, and basically buying the votes of so-called natural partners who can support him and ensure he stays in the job. It's just moving backward." When asked if there was a possibility Zionist Union would join Netanyahu's coalition, Livni flat out stated her party was headed for the Opposition. "We said clear things before the election," Livni stressed. "There is huge gap in our viewpoints - how we view the State of Israel, where we think it needs to go. A government is set up to promote its path. We will be in the Opposition, leading our path. We will fight the areas that this government tries to lead the Israeli people to." Continuing her attack on the fledgeling coalition, Livni took the Prime Minister to task for Likud's oft-criticized deal with United Torah Judaism. "The funds provided to the haredim do not engage in any sort of step forward," Livni bemoaned. "Rather they represent a giant step backward, just as [the community] began the process of integration into military service and the work force." Also angering Livni was "the money invested in the settlements [communities in Judea and Samaria]," which she asserted, would only "aggravate" Israel's "isolated" international status. "The end result is a bad result for the people of Israel," Livni charged. "Is it a better result for Netanyahu? He paid an exorbitant price, but survival is probably more important to him than anything else."